Your App might have it hard when it comes to marketing. Your brand building is weak, you don’t have a lot of revenue coming in and you are on a limited budget. What’s more, you probably don’t even have a dedicated team member for Android localization – you may be doing everything yourself. They say, “if I localize my cool App, people will purchase it”. If you’re serious about generating download rates, increasing App purchases, building your reputation and attracting new clients, you need to be very systematic. Otherwise, you’re taking the wrong road. Well, today I’m going to tell you about basic misconceptions that I have seen perpetuated among my customers. #1: Most people in Russia speak English, so it is fine just to localize keywords and description to be visible in the App Store. For your App to go viral in the Russian market, it is paramount to offer culturally-tailored content. According to the latest statistics (2015) only 8% of Russians can speak English. Russian target audience doesn’t want exactly the same content as your existing English targets. A striking example that shatters this myth is Candy Crush. The game failed to get into the Top 10 list in Russia because it was not localized to Russian. #2: Keywords can be just translated into Russian. No secret, a perfect keyword is the one with a high-volume and low-competition. Translating keywords may lead to totally ineffective and pointless keywords in the target language because each country and target audience has different keywords even for the same search term. A marketing slogan or message in English might be a total disaster in Russian. A perfect keyword (with a high-volume and low-competition) in English can be translated into a very poor keyword in Russian which won’t make your App visible in the Russian market. Therefore, the best solution is to localize keywords for your App. #3: Crowdsourcing is fine to use for your Android localization to enter the market. Crowdsourcing is a new approach to translation services which combines auto and human translation. Crowdsourcing services offer extremely low rates, what makes them very attractive for clients. But there are quite a few disadvantages. The first one is that you never know who will translate your files. You won’t be able to communicate with a translator, give your recommendations and control the work process. All you get is ready translation and no guarantees that it was localized right. If you are a risky person, you should definitely like it, because it doesn’t seem to be a translation service anymore, it feels like playing Russian roulette. 97% of Russians use local social networks: Go get them! In an ideal world, every brand would have a presence on every popular social media channel, and would enjoy significant levels of engagement from these. But in the real world, to achieve good results, share dynamic, two—way, continuous engagement, it is critical to focus on locally popular social platforms. Facebook doesn’t rule the social world in Russia like in many other countries. By comparison, vKontakte (VK) engages around 57 mln monthly users, followed by Odnoklassniki with 43 mln and Moi Mir (My World) with 31 mln. As reported by Common Sense Advisory 75% of non- English speakers are more likely to purchase something if the support service is in their own language. 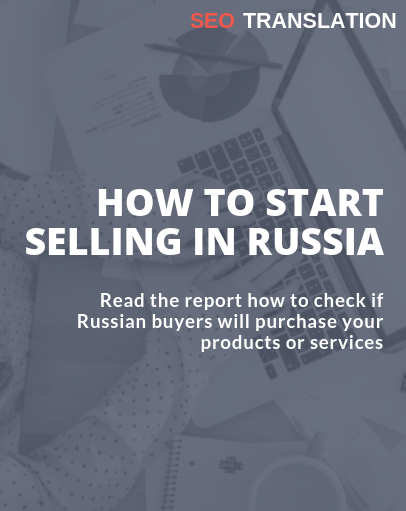 Offering a customer-tailored support will not only increase your app download rates in the Russian market, but will also be a good way to satisfy and delight your Russian-speaking customers. Local Android localization including customer support, will certainly bring a lot of engagements and increase download rates. App Localization Solutions: MVP or Piloting? Android App stores vary from country to country. Although Russia’s mobile market is considerably smaller than those of the United States and Asia, many agree that it has a significant growth potential. According to the recent research results, the volume of the Russian mobile apps market amounts approximately USD 300 mln, and analysrs expect it to keep on growing. And despite the recent slowdown of Russia’s economy, forecasts are rather optimistic. The growth will be driven by such factors as increasing number of mobile devices, fast development of 4G networks and the general shift of consumption and communication habits toward mobile. When entering Russian App market, it is important to take into consideration other application stores which are popular on the local level. Today Yandex.Store is the best option in Russia. This is a special application manager built on the Android platform. As stated in the latest statistics there are more than 150,000 applications there. It covers the following Russian-speaking countries: Russia, Ukraine, Kazakhstan, Belarus and Turkey. You can find out more about other popular App Stores in Russia in my article about a flourishing mobile App marketing in Russia. #7: Market research in Russia is unnecessary for my Android localization, as it is doing well in English. Today number one search engine in the Russian market is Yandex. If initially your App is in English and is doing well with Google, then it is essential to check the App status in Yandex. Search results will provide you with an overview how your localized App may set against your recently identified key competitors. You can undertake external observation – just go to their site and perform audit. Investigate if their websites are built on the highest competent and skilled level, if there is much unique content, etc. This basic website research can bring you a lot of information about how businesslike your competitors are. You can also employ special SEO tools to check their online presence in the Russian-speaking market.